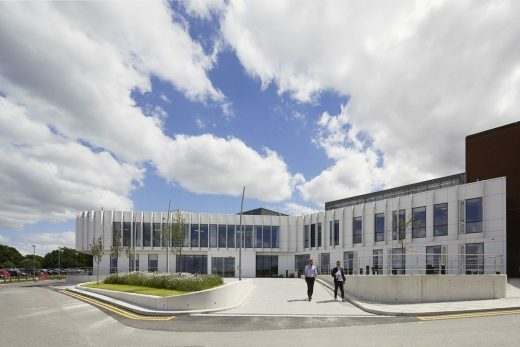 NGS Macmillan Unit in Chesterfield Royal Hospital gathers fragmented cancer services into unique, purpose-built cancer treatment unit integrated with pastoral care. 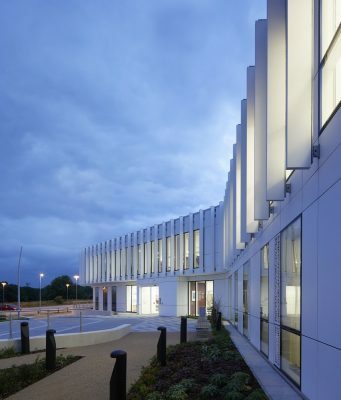 The new state-of-the-art NGS Macmillan Unit in Chesterfield Royal Hospital has been completed by award winning architecture and interiors practice The Manser Practice. 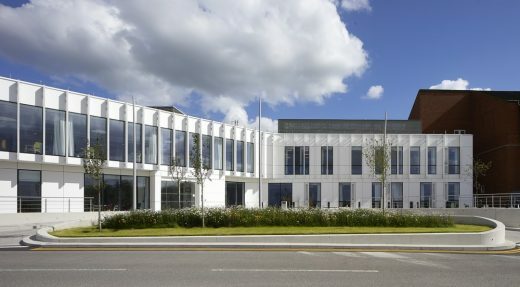 Working on behalf of Chesterfield Royal Hospital and Macmillan Cancer Support, The Manser Practice has transformed the hospital’s existing offer of on-site cancer services into a £10m purpose-built cancer unit, drastically improving the fragmented layout of treatment facilities and integrating pastoral care with an onsite Macmillan Information and Support Centre. Split across two levels, the new NGS Macmillan Unit has gathered all of the hospital’s core and support services and positioned them in one, accessible area. 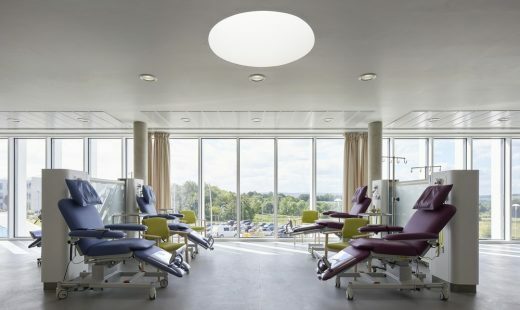 The unit has created a combined treatment room at first floor level with extended views of the Derbyshire landscape, linking to the main hospital and relevant departments via a new glazed bridge. The Macmillan Information and Support Centre is located on the ground floor, greeting visitors as they arrive and leave the unit. It is part of the new service that makes it one of the first hospitals in the UK to provide truly holistic cancer care in one unit. 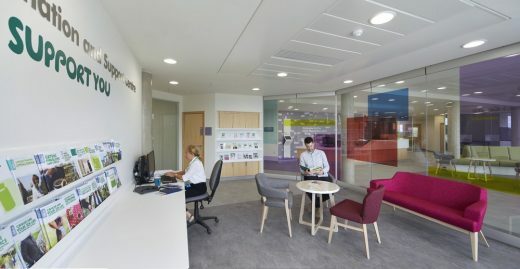 The design team worked with a health planner, the clinical and estates teams, Macmillan and patients from the very inception of the scheme to ensure that their needs were placed at the core of the new unit. 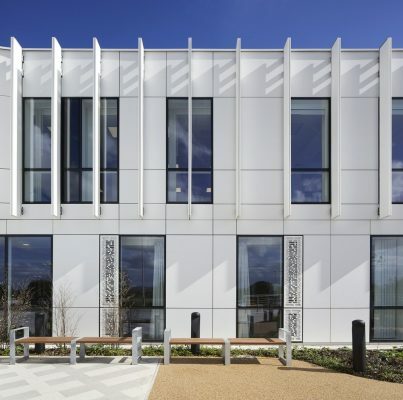 In doing so, The Manser Practice has coupled an uplifting and therapeutic design, with an efficient and well-organised layout, developing and enhancing the way services are delivered and considering the patient journey, clinical timetabling and room occupancy as central to the design. 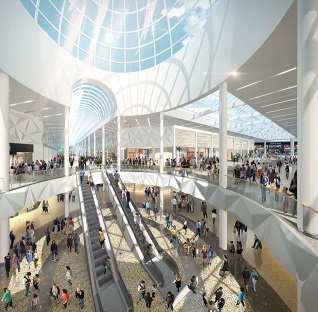 The architects drew on their experience in the hotel and transport sectors to create a calm and well-planned environment to be cared for and to work in, with a welcoming entrance and clear and simple wayfinding throughout the building. 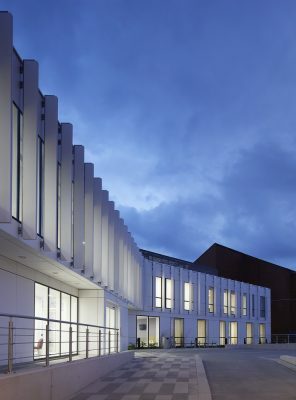 The complex project required The Manser Practice to work closely alongside all of the relevant hospital departments to create a detailed analysis of their schedule, defining the care pathways and identifying the optimum number of key clinical rooms. 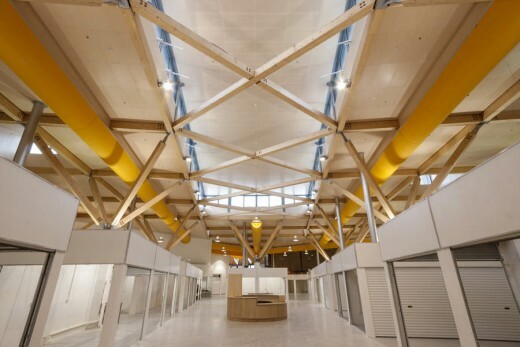 This research provided the architects with a deep understanding of the specialist treatment rooms required and the need for different rooms at given times, allowing them to create combined treatment facilities and rationalise the building’s use by 30% to create a more sustainable and efficient design. “The NGS Macmillan unit has had a very positive impact on the cancer services we deliver here at Chesterfield Royal Hospital. 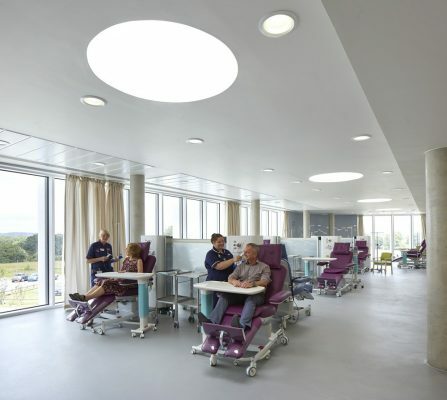 It provides patients with a smoother transition throughout the facilities, including haematology, oncology, phlebotomy and pharmacy. The building has also vastly improved the communication between staff teams, as we are all under one roof, which prevents unnecessary delays to patient appointment times. 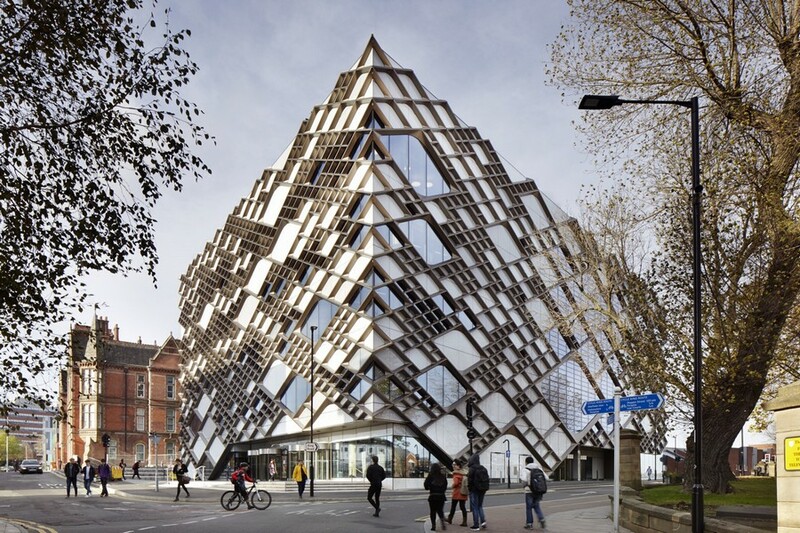 The unit is one of the first buildings in the UK to be clad in Corian. The Manser Practice selected Corian for its clean contemporary look, and because it is exceptionally malleable, robust and low-maintenance. The material can be thermoformed, jointed and laser cut, enabling the use of fins across the building’s curved façade, and also the artwork and detailing worked into the vent panels and louvres. 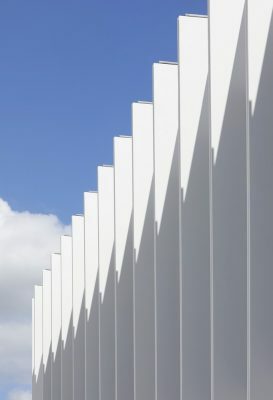 Corian has been applied internally as well externally to create a strong link between the spaces. 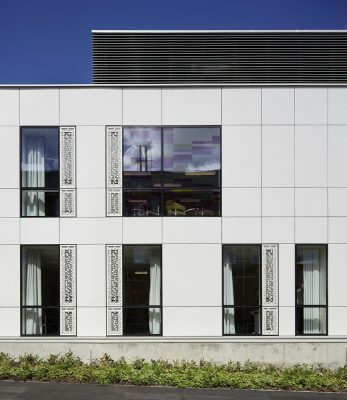 As the design developed the architects worked in close collaboration with the patients and staff and the architects, artists and designers to fully integrate artwork into the internal and external fabric of the new building.